We all know winning is fun, but having fun is leading to winning for this year’s Texas Football team. Through the preseason on The Forty Acres and on through the opening loss to Maryland, the Longhorns kept having fun while working hard, and the enjoyment led to a win. And another, and another. Every game is a joy for the Horns now, junior defensive back Brandon Jones said this week in Bellmont Hall at DKR-Texas Memorial Stadium. “When you’re having fun and you just know what you’re capable of doing and know you can trust your training we’ve done all week,” Jones told Horns Illustrated. “The games are easy compared to practice. We work our butts off at practice. Kansas State has made sure Texas felt like they were roughed up on the rugged streets of New York each time the Longhorns have visited Manhattan, Kan. since 2002. Along with joy comes an intense focus, one that will need be heightened as Texas looks to pick up a fourth-straight win and its first win in more than a decade playing at the Wildcats’ home. 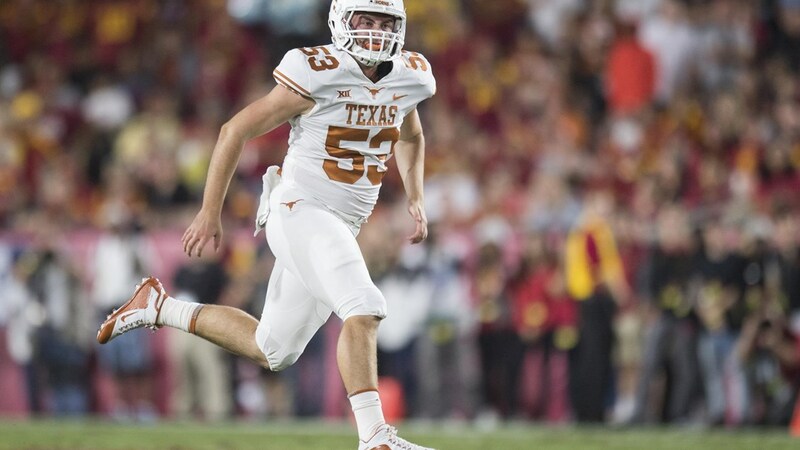 Texas Longhorns’ deep snapper Jak Holbrook was named a semifinalist for the 2018 William V. Campbell Trophy this week, the National Football Foundation & College Hall of Fame announced (photo courtesy of texassports.com). Texas Longhorns’ deep snapper Jak Holbrook was named a semifinalist for the 2018 William V. Campbell Trophy this week, the National Football Foundation & College Hall of Fame announced. The highly prestigious award recognizes an individual as the absolute best football scholar-athlete in the nation, and will be announced at the end of October. A native of Austin, Holbrook graduated with a degree in Radio-Television-Film from UT in the spring. He has played in 29 career games and was named first-team Academic All-Big 12 in each of the past two seasons. He is a six-time member of the Big 12 Commissioner’s Honor Roll and was named 2017 CoSIDA Academic All-District 7. Holbrook was also a recipient of the Big 12’s highest academic honor, the 2018 Dr. Gerald Lage Academic Achievement Award. Standout Texas freshman rower Kaitlin Knifton was named to the 87-member US Youth Olympic Team that will compete at the Summer Youth Olympic Games Buenos Aires 2018 from October 6-18 in Argentina. Hailing from Austin and a McCallum High alum, Knifton will race in the pair alongside partner Catherine Garrett. Racing begins on October 7 and will feature a four-lane 500-meter course. 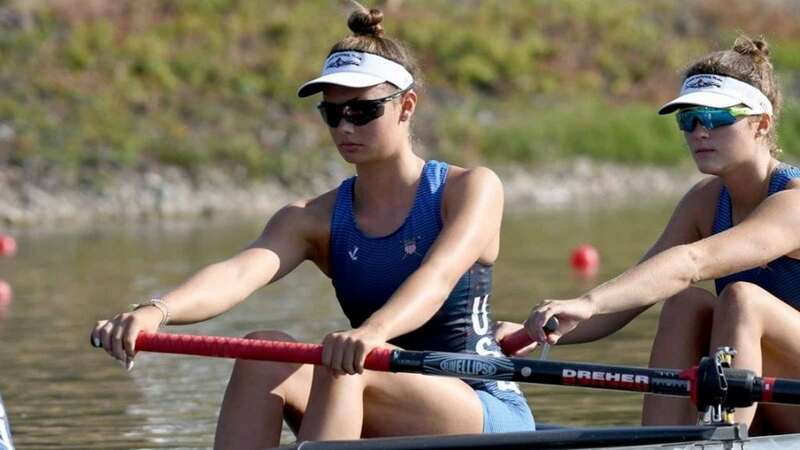 The talented young rower finished third in the coxed four this summer at the 2018 World Rowing Junior Championships in the Czech Republic, and she also claimed silver in the pair at the 2018 U.S. Rowing Youth National Championships with her club team Texas Rowing Center. Additionally, she rowed for Team USA in the pair at the 2017 World Rowing Junior Championships in Lithuania, where she finished ninth overall. The Games will be broadcast on Olympic Channel every night, beginning with the Opening Ceremony on October 6. In addition, OlympicChannel.com and the Olympic Channel app will offer a 24/7 channel with live streams, replays and highlights. 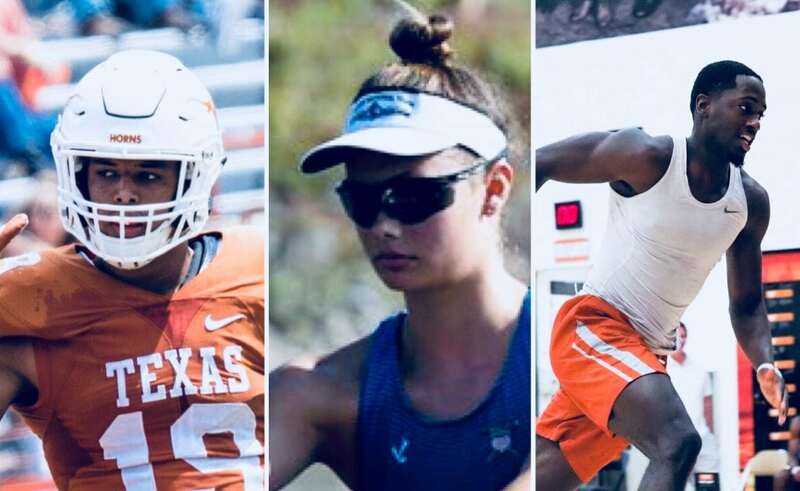 Standout Texas freshman rower Kaitlin Knifton was named to the 87-member US Youth Olympic Team that will compete at the Summer Youth Olympic Games Buenos Aires 2018 from October 6-18 in Argentina (photo courtesy of texassports.com). As the Texas Soccer team sets to take on No. 13 Oklahoma State Friday in Stillwater, Okla., a pair of Longhorns are north of the border playing in Canada. The Longhorns will again be without freshman midfielder Julia Grosso and freshman defender Emma Regan, both important starters, for both matches this weekend. The duo are currently participating in Team Canada’s CONCACAF Qualifying Camp. The road is already tough for Texas, as the Burnt Orange & White hasn’t won in Stillwater, Okla., since 2002 or Fort Worth against TCU since 2008. University of Texas ace Bianca Turati posted a 6-3, 6-1 victory against Tiphanie Fiquet (France) this morning in the Round of 16 at the ITF (International Tennis Federation) pro circuit event at Van Der Meet Shipyard Racquet Club. The event continues through the weekend, visit the tourney web site: https://www.itftennis.com/procircuit/tournaments/women's-tournament/info.aspx?tournamentid=1100043327. Fans are also encouraged to follow UT’s official Twitter (@TexasWTN) for results and additional information. Both the Texas men’s and women’s cross country programs take on the field at the Nuttycombe Wisconsin Invitational in Madison Friday. The race will be held on the Thomas Zimmer Championship Course, the site of the 2018 NCAA Cross Country Championships. The Texas Men’s Basketball team opens up practice today, while the women’s team will start practice on Sunday for the 2018-19 season. Former Texas women’s basketball player Empress Davenport has been named assistant women’s basketball coach at Lamar University, the school announced Thursday. Davenport played in 131 games with 97 starts during her four-year career on the Forty Acres from 2012-16. She helped the Longhorns to three NCAA Tournament appearances, including an NCAA Elite Eight showing her senior season of 2015-16. She was an Honorable Mention All-Big 12 selection in 2016, helping Texas finish 31-5 and record its most victories in a single season since 1987-88. For her Texas career, she averaged 7.2 points per game, 3.6 rebounds per game and 2.2 assists per game. Davenport graduated from UT in 2016 with a bachelor’s degree in applied learning and development. Following graduation, she played one season with Alvik Basket, a professional team in Sweden. 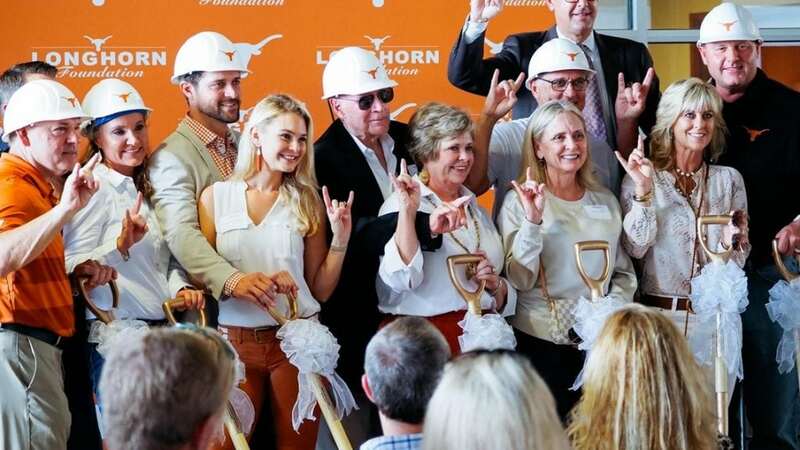 Last week Texas Athletics officially broke ground on the J. Dan Brown Family Player Development Center, a state-of-the-art indoor training facility for the Texas Baseball program. The project, which is expected to be completed in Spring 2019, is the first athletics facility on the Forty Acres that is funded solely by donors. In addition to the ceremony's speakers—Vice President and Athletics Director Chris Del Conte, head coach David Pierce, J. Dan Brown, and Roger Clemens — the current Texas Baseball team, several alumni and a large group of donors were on hand for the event.